All things happy are in Touringkitty! Hello, I’m Em Alcantara. I am a classical singer (a coloratura soprano by classification), music educator, cultural worker, writer, children’s choir conductor, wife to an amazing writer/tenor/martial artist, and mommy to a beautiful and bright homeschooled preschooler. I’m a Certified Breastfeeding Peer Counselor under LATCH and an attachment parenting advocate, advocating breastfeeding (which I did for five and a half years for my firstborn), babywearing, co-sleeping, positive parenting, and homeschooling. The name of this blog is my brainchild. I used to sing with a world-renowned choral group, the Philippine Madrigal Singers, and I am a certified Hello Kitty lover. These two things came together during a European trip in 2006, and since then, I have been known to social media as Touringkitty. 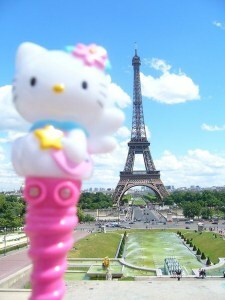 Touringkitty with the Eiffel Tower as her backdrop, during the Philippine Madrigal Singers European tour. Read here bits and pieces about the many things we all love: music, family, life, and love. Connect with me via Facebook, Twitter and Instagram (@touringkitty).